It's no wonder you're ready for fall! Bonfires and big cozy hugs come to mind when you see the Woodland Wonder arrangement. 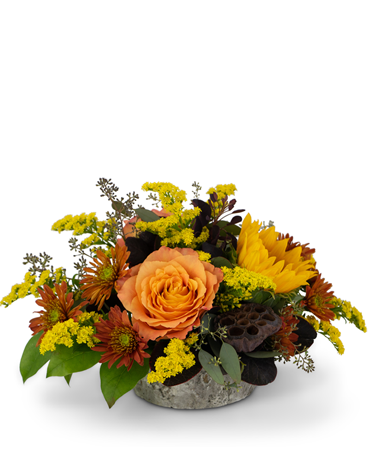 A blend of Roses, Sunflowers, Solidago, Mums and Lotus Pods are arranged in a naturally weathered oak vase. The Woodland Wonder arrangement is a great way to enjoy the fall season.